The Austro-Hungarian Army (German: Landstreitkräfte Österreich-Ungarns; Hungarian: Császári és Királyi Hadsereg) was the ground force of the Austro-Hungarian Dual Monarchy from 1867 to 1918. It was composed of three parts: the joint army (Gemeinsame Armee, "Common Army", recruited from all parts of the country), the Imperial Austrian Landwehr (recruited from Cisleithania), and the Royal Hungarian Honvéd (recruited from Transleithania). In the wake of fighting between the Austrian Empire and the Hungarian Kingdom and the two decades of uneasy co-existence following, Hungarian soldiers served either in mixed units or were stationed away from Hungarian areas. With the Austro-Hungarian Compromise of 1867 the new tripartite army was brought into being. It existed until the disestablishment of the Austro-Hungarian Empire following World War I in 1918. The joint "Imperial and Royal Army" (kaiserlich und königliche Armee or k.u.k.) 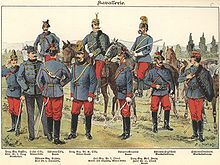 units were generally poorly trained and had very limited access to new equipment because the governments of the Austrian and Hungarian parts of the empire often preferred to generously fund their own units instead of outfitting all three army branches equally. All of the Honvédség and the Landwehr regiments were composed of three battalions, while the joint army k.u.k. regiments had four. The long-standing white infantry uniforms were replaced in the later half of the 19th century with dark blue tunics, which in turn were replaced by a pike grey uniform used in the initial stages of World War I. In September 1915, field gray was adopted as the new official uniform colour. The last known surviving member of the Austro-Hungarian Army was World War I veteran Franz Künstler, who died in May 2008 at the age of 107. He was a firm conservative in all matters, military and civil, and took to writing pamphlets lamenting the state of the Army’s morale as well as fighting a fierce rearguard action against all forms of innovation…. Much of the Austrian failure in the First World War can be traced back to his long period of power…. His power was that of the bureaucrat, not the fighting soldier, and his thirty years of command over the peacetime Habsburg Army made it a flabby instrument of war. Austria-Hungary avoided major wars in the era between 1867 and 1914 but engaged in a number of minor military actions. Nevertheless, the general staff maintained plans for major wars against neighboring powers, especially Italy, Serbia and Russia. By contrast, the main enemies Russia and Serbia had engaged in large scale warfare in the decade before the First World War. In the late 19th century the army was used to suppress unrest in urban areas of the empire: in 1882 and 1887 in Vienna and notably against German nationalists at Graz and Czech nationalists in Prague in November 1897. Soldiers under the command of Conrad von Hotzendorf were also used against Italian rioters in Trieste in 1902. The most significant action by soldiers of the Dual Monarchy in this period was the Austro-Hungarian occupation of Bosnia and Herzegovina in the summer of 1878. When troops under the command of Josip Filipović and Stjepan Jovanović entered the provinces expecting little or no resistance, they were met with ferocious opposition from elements of both Muslim and Orthodox populations there. Despite setbacks at Maglaj and Tuzla, Sarajevo was occupied in October. Austro-Hungarian casualties amounted to over 5,000 and the unexpected violence of the campaign led to recriminations between commanders and political leaders. In 1868, the number of active-duty troops in the army was 355,000, and the total could be expanded to 800,000 upon mobilization. However, this was significantly less than the European powers of France, the North German Confederation and Russia, each of which could field more than one million men. Though the population of the empire had risen to nearly 50 million by 1900, the size of the army was tied to ceilings established in 1889. Thus, at the start of the 20th century, Austria-Hungary conscripted only 0.29% of its population, compared to 0.47% in Germany, 0.35% in Russia and 0.75% in France. The 1889 army law was not revised until 1912, which allowed for an increase in annual conscriptions. The ethnic make-up of the enlisted ranks reflected the diversity of the empire the army served; in 1906, out of every 1000 enlisted men, there were 267 Germans, 223 Hungarians, 135 Czechs, 85 Poles, 81 Ukrainians, 67 Croats and Serbs, 64 Romanians, 38 Slovaks, 26 Slovenes, and 14 Italians. From a religious standpoint, the Austro-Hungarian army officer corps was dominated by Roman Catholics. In 1896, out of 1000 officers, 791 were Roman Catholics, 86 Protestants, 84 Jews, 39 Greek-Orthodox, and one Uniate. Of the pre–World War military forces of the major European powers, the Austro-Hungarian army was almost alone in its regular promotion of Jews to positions of command. While the Jewish population of the lands of the Dual Monarchy 4.4% including Bosnia-Herzegovna), Jews made up nearly 18% of the reserve officer corps. There were no official barriers to military service for Jews, but in later years this tolerance eroded to some extent, as important figures such as Conrad von Hötzendorf and Archduke Franz Ferdinand sometimes expressed anti-Jewish sentiments. Franz Ferdinand was also accused (by Conrad) of discriminating against Protestant officers. Following the 1867 constitutional arrangements, the Reichsrat was dominated by German Liberals, who generally regarded the army as a relic of feudalism. In Budapest, legislators were reluctant to authorize funds for the joint army but were generous with the Hungarian branch of the army, the Honvédség. In 1867 the military budget accounted for about 25% of all government spending, but the economic crash of 1873 hit Austria-Hungary hard and foreign observers questioned whether the Dual Monarchy could manage a major war without subsidies. Despite increases throughout the 1850s and 1860s, in the latter half of the century Austria-Hungary was still spending less on its army than were other major European powers. While the budget continued to rise—from 262 million crowns in 1895 to 306 million in 1906—this was still far less per capita than for other major European states, including Italy, and about on par with Russia, which had a much larger population. Further contributing to the monarchy's military weakness was the low rate of conscription: Austria-Hungary conscripted only 0.29% of its population annually, compared to 0.47% in Germany and 0.75% in France. Attempts to increase the yearly intake of recruits were proposed but repeatedly blocked by officials in Budapest until an agreement was reached in 1912. In the emerging field of military aviation, Austria-Hungary lagged behind other European states. While balloon detachments had been established in 1893, they were mostly assigned to the fortress artillery, except for a brief period from 1909 to 1911 when they were under command of the multifaceted Verkehrs Brigade. Realization that heavier-than-air machines were necessary or useful came late, and Austria-Hungary acquired only five airplanes by 1911. In 1914 the budget for military aviation was approximately ​1⁄25th the amount spent by France. Austria-Hungary entered the war with only 48 first-line aircraft. Austria-Hungary had a complex military structure. The country had three main distinct ground forces. As a union the Monarchy had a common government of three ministers (Minister of the Imperial Household and Foreign Affairs; Minister of War and Minister of Finance). The Imperial Minister of War had authority over the Common Army, the Navy and (shortly before and during WWI the newly established independent) the Air Troops. regiments of the common army were designated Imperial and Royal (German: "kaiserlich und königlich" (k.u.k. ); Hungarian: "Császári és Királyi"), in which Imperial stands for the Kaiser of Austria, who was also King of Hungary. Hungarian Honvéd regiments were called Royal Hungarian for the Kaiser's title of Apostolic King of Hungary (German: königlich ungarisch; Hungarian: Magyar Királyi). Within the Hungarian part of Austria-Hungary the monarch was also King of Croatia-Slavonia, this was however not included in the titles of the Honvéd's units. After war was declared, 3.35 million men (including the first call-up of the reserves and the 1914 recruits) gathered for action. The Austro-Hungarian Imperial Army was officially under the control of the Commander-in-Chief, Emperor Franz Josef. By 1914, however, Franz Josef was 84 years old and the chief of staff, Count Franz Conrad von Hötzendorf, effectively had more power over the armed forces. Conrad favored an aggressive foreign policy and advocated the use of military action to solve Austria-Hungary's territorial disputes with Italy and Serbia. Archduke Friedrich, Duke of Teschen was appointed Supreme Commander of the Austro-Hungarian army by Franz Joseph on July 11, 1914. It was thought he would not interfere with the operational and tactical plans of Conrad von Hötzendorf. Friedrich remained Supreme Commander until February 1917, when Emperor Charles I decided to assume the office himself. The Imperial-Royal Landwehr (k.k. or kaiserlich österreichisch/königlich böhmisch) was the standing army of Austria responsible for the defence of Austria itself. The Royal Hungarian Landwehr (königlich ungarische Landwehr) or Royal Hungarian Honvéd (k.u. Honvéd) was the standing army of Hungary. A part of the Honvéd was the Royal Croatian Landwehr (Kraljevsko hrvatsko domobranstvo), which consisted of 1 infantry division (out of 7 in Honvéd) and 1 cavalry regiment (out of 10 in the Honvéd). The infantry regiments of the k.u.k. army had four battalions each; the infantry regiments of the k.k. and k.u. Landwehr had three battalions each, except the 3rd Regiment of the "Tiroler Landesschützen" (Tyrolian fusiliers), that had also four battalions. In 1915 units that had nicknames or names of honour lost them by order of the War Ministry. Thereafter units were designated only by number. For instance, the k.u.k. Infanterie-Regiment (Hoch und Deutschmeister) Nr. 4 became Infanterie-Regiment No. 4 (4th Infantry Regiment). 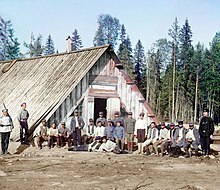 The Landsturm consisted of men aged 34 to 55 who belonged to the Austria k.k. Landsturm and the Hungarian k.u. Landsturm. The Landsturm formed 40 regiments totaling 136 battalions in Austria and 32 regiments totaling 97 battalions in Hungary. The Landsturm was a reserve force intended to provide replacements for the first line units. However, the Landsturm provided 20 brigades who took to the field with the rest of the army. The Standschützen (singular: Standesschütze[A. 1]) were originally rifle guilds and rifle companies that had been formed in the 15th and 16th centuries, and were involved time and again in military operations within the borders of the Austrian County of Tyrol. A Standschütze was a member of a Schützenstand ("shooting club"), into which he was enrolled,[A. 2] which automatically committed him to the voluntary, military protection of the state of Tyrol (and Vorarlberg). In effect they were a type of Tyrolean local militia or home guard. Please note, that the first name is always in German. The ranks displayed after the "/" are the Hungarian and Croatian equivalents of the Austrian ranks, since they were used in this format in the Magyar Királyi Honvédség / königlich ungarische Landwehr (Royal Hungarian Home Defence Forces) as well as in the Kraljevsko Hrvatsko Domobranstvo / königlich kroatische Landwehr (Royal Croatian Home Guard). The English equivalents are from the Austrian Bundesheer's homepage. ^ Rothenberg, G. (1976). The Army of Francis Joseph. West Lafayette, IN: Purdue University Press. p. 83. ISBN 0911198415. ^ Rothenberg 1976, p. 193. ^ John Keegan and Andrew Wheatcroft, Who's Who in Military History: From 1453 to the Present Day (2001) p, 12. ^ Rothenberg 1976, pp. 97, 99, 113–17, 124–25, 159. ^ Rothenberg 1976, p. 121. ^ Rothenberg 1976, p. 130. ^ Rothenberg 1976, p. 143. ^ Rothenberg 1976, pp. 101–02. ^ Rothenberg 1976, p. 81. ^ a b Rothenberg 1976, p. 126. ^ Rothenberg 1976, pp. 126, 165. ^ a b Rothenberg 1976, p. 128. ^ Rothenberg 1976, p. 118. ^ Rothenberg 1976, p. 142, 151. ^ a b Rothenberg 1976, p. 78. ^ Rothenberg 1976, pp. 125–26. ^ a b Rothenberg 1976, p. 175. ^ Steiner, Glenn Jewison & Jörg C. "Austro-Hungarian Land Forces 1848-1918". www.austro-hungarian-army.co.uk. Retrieved 2018-10-04. ^ The German word Standschütze is derived from Schützenstand or Schießstand, which means "firing point" or "firing range", and generally refers to the members of a local shooting club – the Schießstand, Schützenstand or Schützenverein – in German-speaking countries. These were in essence volunteer militia. They still exist today, albeit their role is purely social and ceremonial. ^ enrolliert is the Austrian military jargon for "enrolled" (from the Old French enroller). Bassett, Richard. For God and Kaiser: The Imperial Austrian Army, 1619-1918 (2016). Deák, István. "The Habsburg army in the first and last days of world war I: a comparative analysis." in Bela K. Kiraly and Nandor F. Dreisziger, eds. East Central European Society in World War I (1985): 301-312. Watson, Alexander. "Managing an ‘Army of Peoples’: Identity, Command and Performance in the Habsburg Officer Corps, 1914–1918." Contemporary European History 25#2 (2016): 233-251. Lichem, Heinz von (1977). Spielhahnstoß und Edelweiß. Graz: Stocker Verlag. ISBN 370200260X. Lichem, Heinz von (1985). Der Tiroler Hochgebirgskrieg 1915–1918. Berwang (Tirol): Steiger Verlag. ISBN 3854230524. Allmeyer-Beck; Lessing (1974). Die K.u.K. Armee 1848–1918. München: Bertelsmann. Rest; Ortner; Ilmig (2002). Des Kaisers Rock im 1. Weltkrieg. Wien: Verlag Militaria. ISBN 3950164200. Schreiber, Georg (1967). Des Kaisers Reiterei. Wien: Verlag Kremayr & Scheriau. Wikimedia Commons has media related to Austro-Hungarian Army.